Halloween decor is worse than a candy store for me. I go in wanting one thing, get distracted and look at ALL of it, and come out with waaay more than I expected. Except it's more that I make more than I expected. My TV console needed to be brought into the Halloween spirit, but all of the decorations I had were lacking either the scale or the "oomph" that I wanted. So I made this witches broom out of tree trimmings and an old broom that I saved from certain death (a.k.a. the trash can). The broom was found in a closet when we moved in, and it's somehow managed to stick around nearly 3 years. It was falling apart, nasty looking, and (it's worst trait) short. Like, a kid's broom. 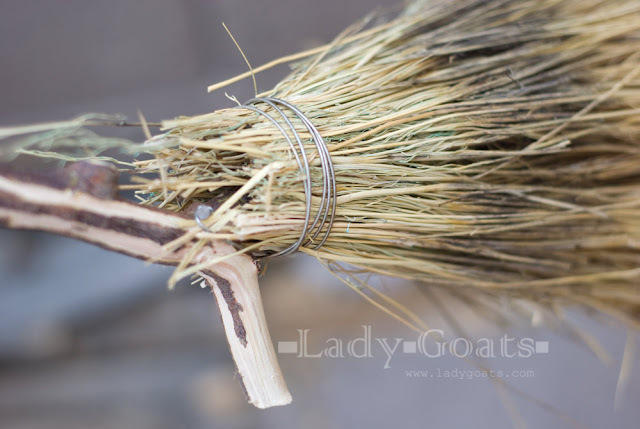 If you have an old, decrepit broom such as this and a tree with an extra branch, you can make this broom for free. 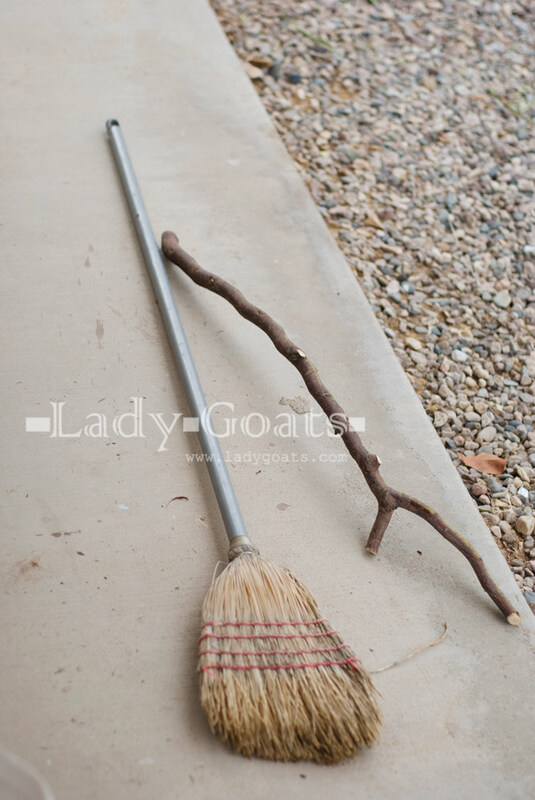 Otherwise, I'm sure Dollar Tree has some crummy brooms (branch is still up to you). 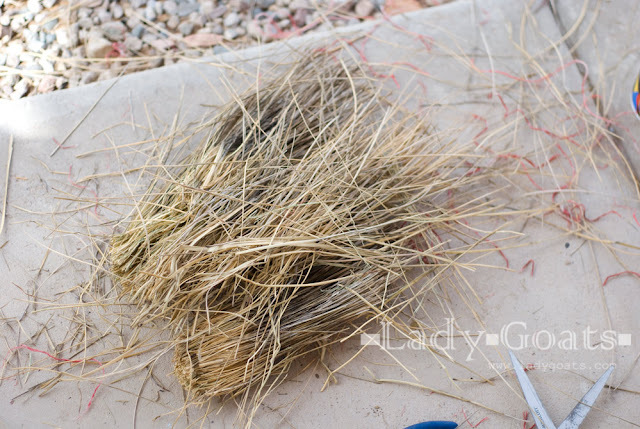 To start, I cut all of the twine that was keeping the bristles orderly. This project becomes really messy really quickly, so you might want to keep a good broom on-hand. 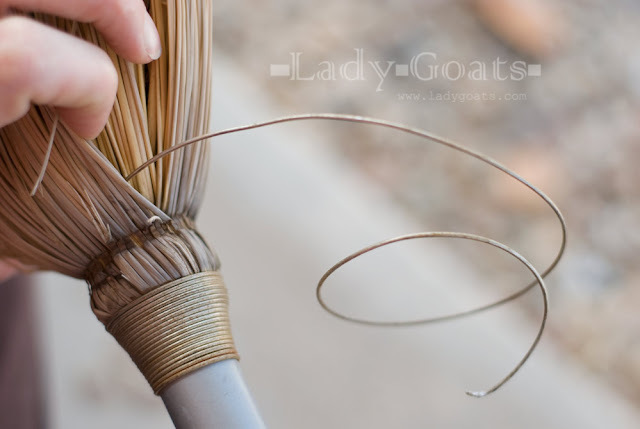 After the twine's cut, find the end of the wire that's holding the bristles to the handle. You'll need to use some needle nose pliers to pull that out. Once it's out, it should be simple to unwind. It goes through "layers" of the bristles, so you'll have to make sure all of the twine is off before you start this, otherwise it holds the bristles together, making it impossible to unwind the wire. Not that I know from experience. You'll wind up with this. To stop this from getting out of hand, I tamed the bristles with some painter's tape. Maybe the coffee and cell phone helped. 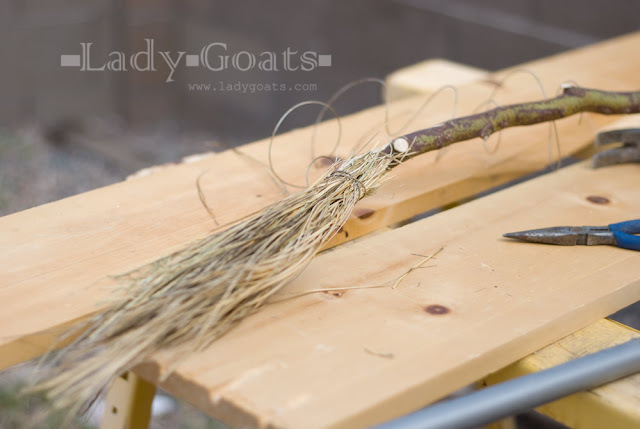 I forgot to take pictures, but the wires were held onto the broom with two small nails. I just pulled those out and reused them for the witches broom. Wrapped the wire around the nail and hammered it into the branch, securing the wire. Then wrapped it around the branch once before holding a thin layer of bristles around the broom and securing it with the wire. I think I did three layers. When I got towards the end of the wire I wrapped the end of it around the needle nose pliers, creating a tiny loop. Make sure you keep the wire taut around the bristles. 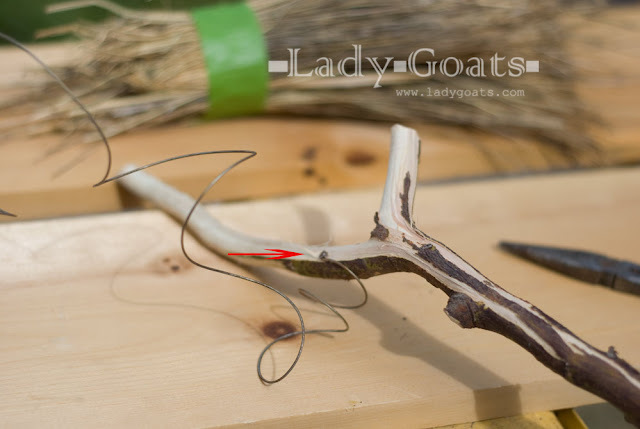 Then stick the second nail into the loop you created, and nail that end of the wire down. 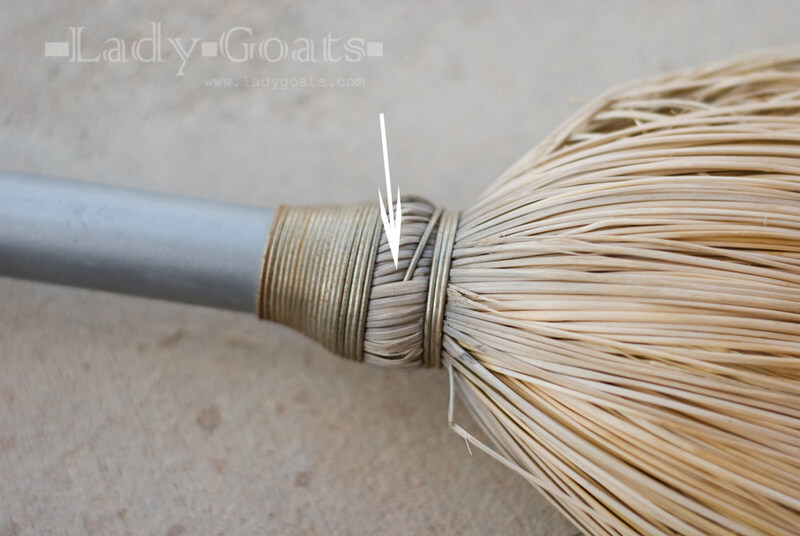 As long as you kept the wire taut around the bristles, they should be held securely in place. Mine are mostly secured (doubt I'd be able to use the broom to sweep without making a bigger mess from the bristles falling out, but it makes for a great decoration). I'm sure hot glue could be used to hold the bristles in place if you don't feel like fiddling with the wire. 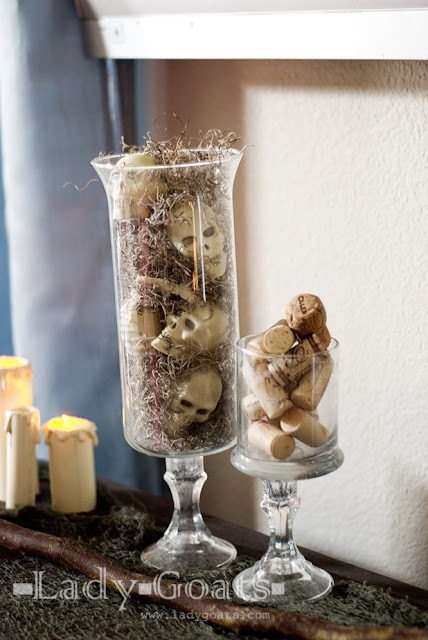 The skulls in the glass were yanked off of the 16" skeletons from Dollar Tree, and the moss is from the floral section of Dollar Tree. I just put corks in the other jar because the color went. Couldn't find anything creepy that I already had. 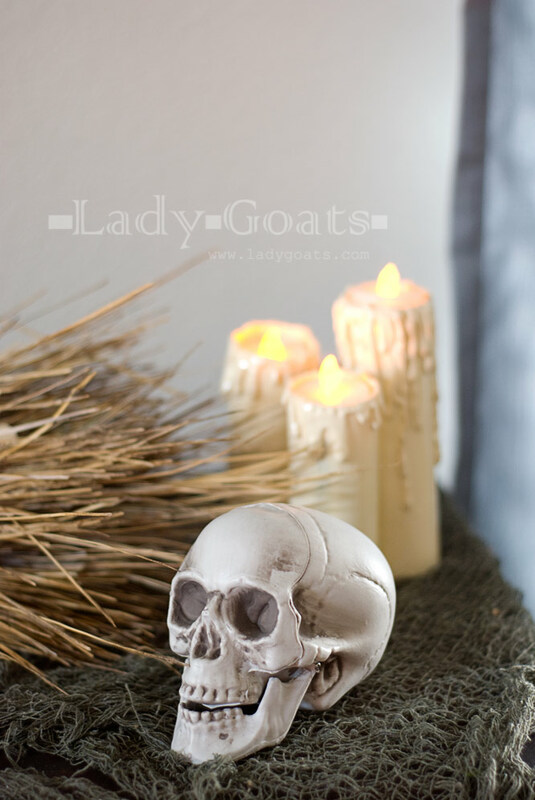 The skulls were like $0.98 from Wal Mart, but what's behind them is my favorite part. Remember when I posted the PVC pipes with hot glue on 'em here? Well, this is the finished product. 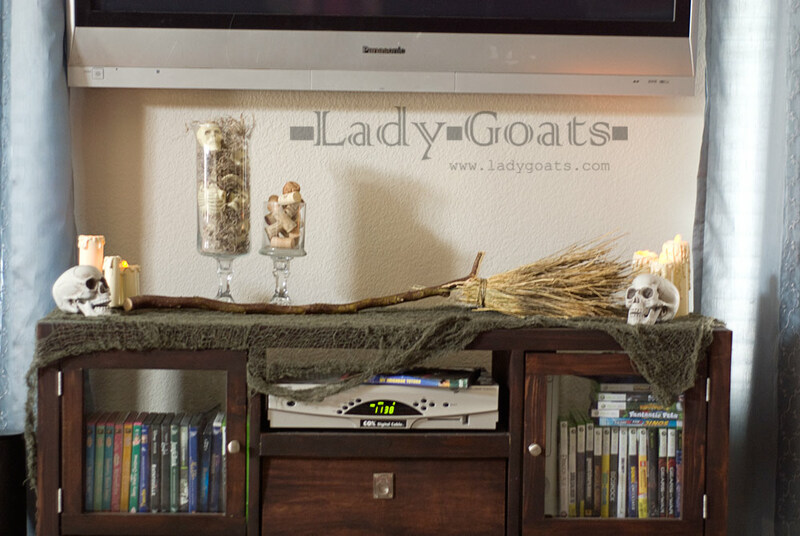 All in all, I really like what the DIYd witches broom adds to the console-scape, and I'm glad I took the few minutes to do it (my favorite part? FREE!). This little touch really brings the holiday indoors! 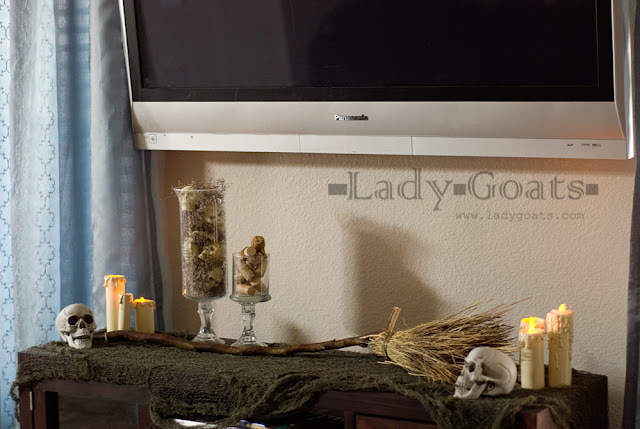 Any cheap/free Halloween projects goin' on in your home? I'd love to hear about it! 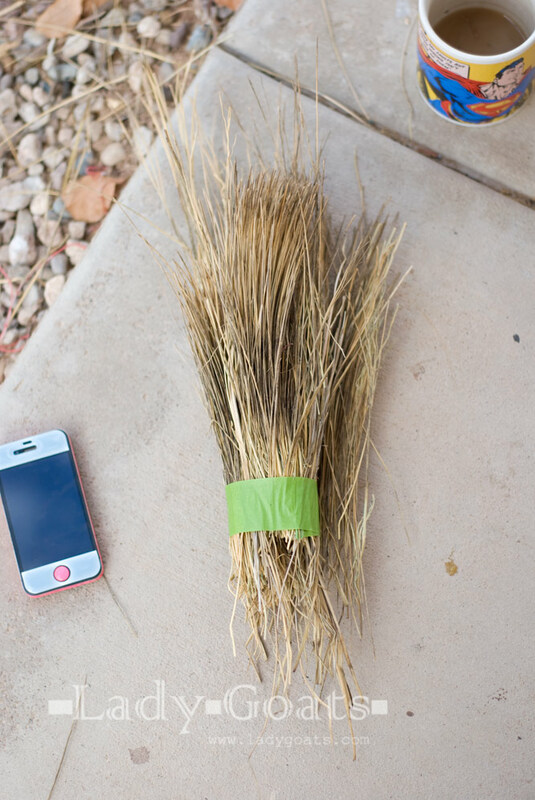 It seems ironic that you'll need to keep a good broom on hand as you dissect an old one. I agree, a tad ironic! 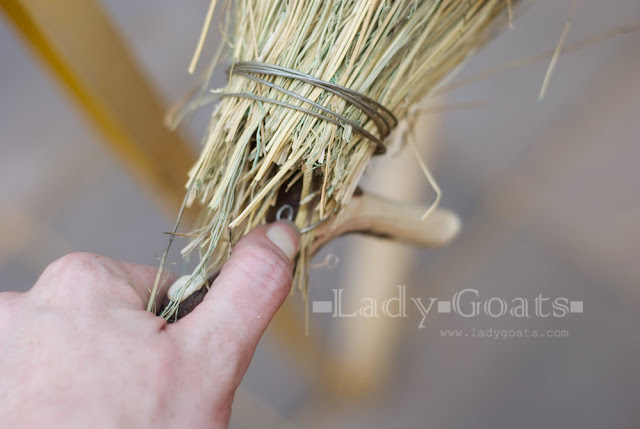 I ended up using the gathered bristles to sweep the small, broken bits away... but it would probably have been better to just be prepared with a useful broom..!